12/31/17: The Fight Is Worth It! Happy New Year’s Eve to you and your family! I trust you’ve been enjoying the holidays with those important to you, while making plans for meaningful commitments in 2018. 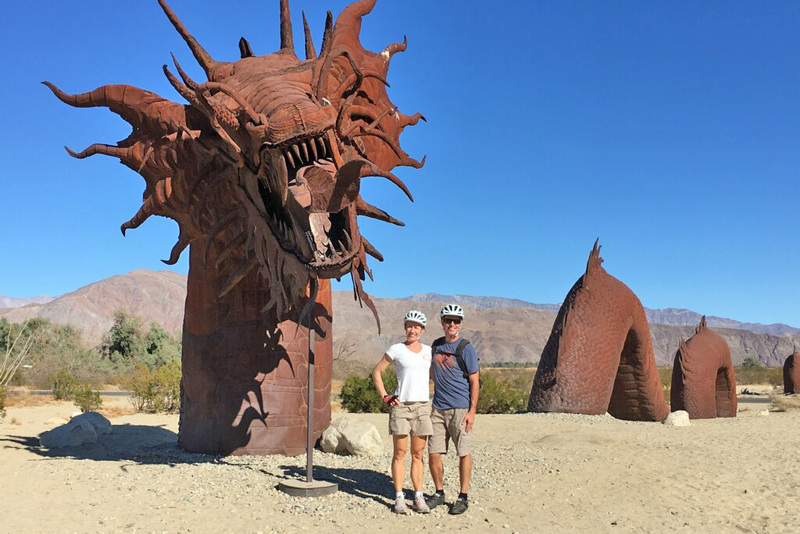 My husband Jeremy and I relished a three-day desert vacation in Anza-Borrego last week, hiking 4,000 feet up Indianhead Mountain the first day and then tooling around on our bicycles with friends in Borrego. This brief respite from our normal routines gave us a welcome chance to reflect – something each of us needs from time to time. 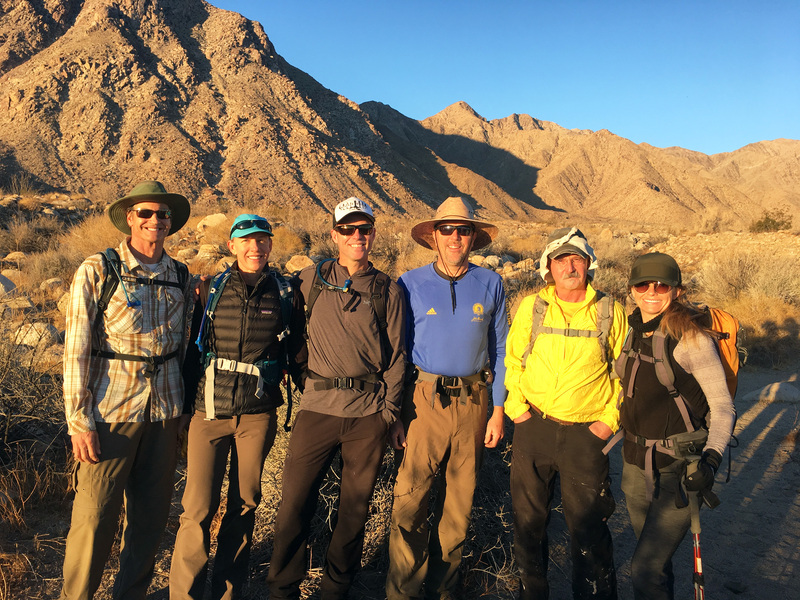 So, in addition to sending you best wishes for the new year and some photos from our Anza-Borrego sojourn, I’d like to share some of my big-picture thoughts with you after one year as your mayor. Next week, we’ll get back to talking about the nitty-gritty of city business. And if you just can’t wait, this article from the Encinitas Advocate, “Blakespear Recalls Success of 2107, Looks Ahead to New Year,” should tide you over until next Sunday! 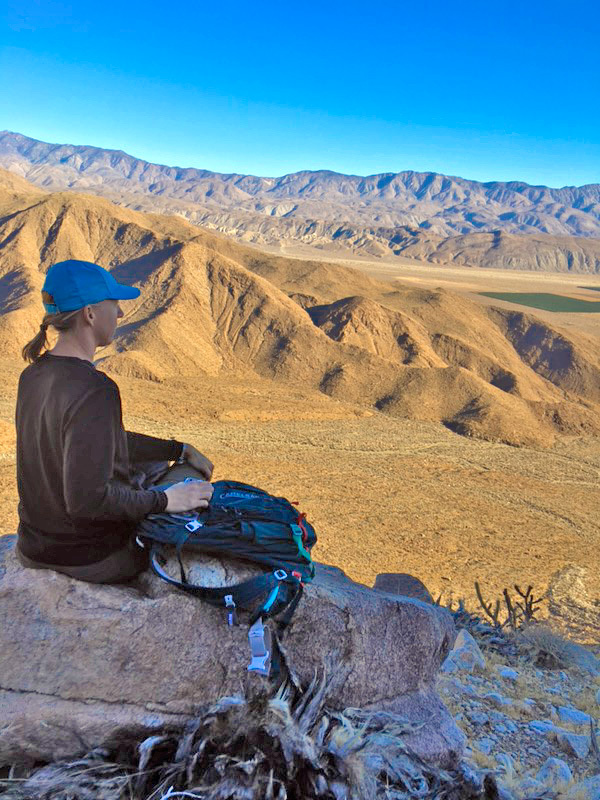 This is Indianhead, located along the north wall of Borrego Palm Canyon. Climbing to the very top was a 7.5 hour commitment, much of it a scramble through peeling granite and shale. The prickly cactuses made our leather gloves and sturdy boots an imperative. I’ve just begun training for a spring trip to the Grand Canyon to hike Havasupai Falls, and this was a great warm-up. Artist Ricardo Breceda created 130 full-sized metal sculptures scattered around the Anza-Borrego desert area. They’re such a fanciful addition to the vastness of the open landscape. Well worth viewing! This stalwart group of hikers made it all the way to the top of Indianhead Mountain! Over the last year or so, I’ve been enthusiastically immersed in our nation’s Revolutionary War period and the aspirational ideals that inspired the founding of our great country. In contrast, I also see with clear eyes the patriarchy and racism endemic to those who lived and prospered in that period. As part of a book club with other elected officials and some local attorneys, I enjoyed reading my first Civil War biography – Grant (by Ron Chernow, who wrote Hamilton). Reconstruction of America after the Civil War was as much a battle as the war itself! Everything is a fight! Everything. If you believe in something – whether it’s a principle, a local improvement project, or a candidate – fight for it. As an elected official, I constantly have to fight for my ideas, priorities and commitments. I stand on the shoulders of those who fought before me, and I lean on those who now fight alongside me. And it’s worth it because that’s how we make progress. So my crucial message to you is this: put yourself out there. Write that letter to the editor or email that elected official, show up at a meeting to speak your truth, raise your hand for a leadership position, claim public space by posting on social media, donate, wear that message shirt, post that yard sign. Fight! I strive always to maintain composure and represent Encinitas with dignity, but one of my main roles is to manage the conflicts roiling just under the surface, all the while continuing to fight for the things that matter. Reading about our nation’s history, watching it depicted in plays, movies and TV shows, visiting our founding documents and witnessing how our American society has evolved for the better based on the highest ideals, inspires me every day to continue to fight. While recognizing that meaningful progress requires this struggle, at base we’re all humans who need each other, advance together and derive ultimate meaning from the bonds forged with others. So I’ll leave you with a quote from Thomas Jefferson, who disliked open inter-personal conflict. Together in this fight and together as friends in 2018!